Check out this amazing Fairy Portal and story created by Trish Miller. We made the fairy for her. Deep in an enchanted forest, there grows a “Twinkle Tree” which is said to hide the entrance of an ancient portal. This is the entrance to the heart of fairy land. Animal spirits from the forest guard this magical portal. Those not worthy are led away and cannot find the portal. When the portal does open, a fairy may pass thru the beautiful grand fairy door. Fairies may arrive in a white carriage pushed by a gigantic winged creature nicknamed “Stilts” and escorted by a white unicorn. Once in the safety of the land of enchantment, all wishes are granted. Only the pure of heart can find the magical ancient portal and are granted permission to pass thru. Several times a year, the portal fairy returns thru the fairy door to our mortal world. She tells of the wondrous tales of that kingdom and its beauty. She carries three black cats everywhere she goes. They are the three time guardians of the portal “past, present and future.” Pegasus sometimes flies up on the balcony to survey all the magical happenings. Sometimes at night it’s possible to see fairies tending to the beautiful flowers. Don’t blink or you might miss a fairy flying through the portal. 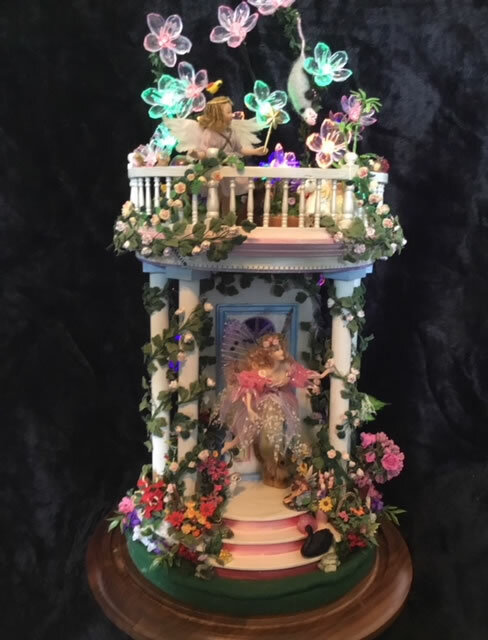 This special fairy world was designed using a Montclair Half Round Portico Porch Kit 602. The painting was finished 5/5/18 to create the ultimate Fairy Door. Plants by Teasale Jeune. Felted animals by Lorrie DeBacker, Angel Swan by Michele Roy, Fairy bowl by Jan Yinger, Fairy fountain by Karen Stull, Rose vines by Bright Delights. Some animals purchased at Ann Arbor Miniature Show 5/11/18. The 2″ dome purchased at an estate sale. Flying fairy made by Teresa Fischer of Prince Edward County, Canada.